Daily Scents Spring Edition : What Do You Smell Around You? What do you smell around you these days? It is officially spring. The Bradford pear trees are draped in the foam of blossoms, its marine connotations echoed by the white petals’ fishy odor. The sticky red buds on maple branches smell sweet and acidic, a mixture of hot metal and honey. On most mornings I step outside and feel uplifted by the bracing freshness. It works better than a cup of coffee! As I enter the subway, I realize that these days I smell more perfume. Since people wear fewer layers, the sillage can be overwhelming. The usual green apple and peach scents of hair products are now supplemented with the fragrances I recognize. On Monday, I sat next to a girl wearing Dior J’Adore. On Wednesday as I was heading back home, a guy wearing Thierry Mugler Angel and tight black jeans complimented me on my perfume–I also wore Angel. Yesterday, my friend and I had to navigate the sushi bar to avoid a lady wearing half a bottle of Chanel Coco Mademoiselle. And this morning I smelled the dewy gardenia and coffee at Starbucks. Not much of a scent revelation, but it made for a more memorable morning. 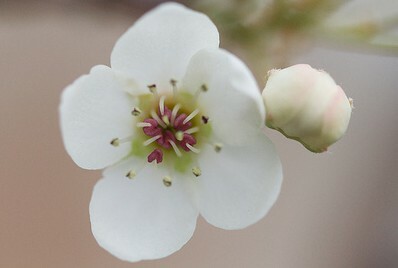 Image: Pear Blossom by kellygifford via flickr, some rights reserved. Kym: I live on the west coast and in the past four weeks enjoyed the blooms of my neighbors magnolia, my own climbing jasmine in full bloom and most recently, another neighbors lemon blossoms. How I love the smells of spring. I hike my dog several times a week in an area full of sages and often pinch the blooms and rub them between my fingers as a walk by. Another neighbor has rosemary, which is always fragrant and I must confess, I almost always pinch a little for a sniff. Perfumista8: This is one of the most beautiful and fragrant Springs in recent memory. We have tons of Daphne shrubs, Jasmine, Mexican Sage, White Sage, Rosemary, Poppies, Eucalyptus Trees and wildflowers. Victoria: That sounds like a perfect perfume! Can you imagine putting all of those scents in a bottle? I think that it would be wonderful. Undina: I’ll have to check what fruit (if any) that tree bears though I doubt it’s a pear tree on a parking lot. Musette: I have Rosarita’s weather (we’re not too far from each other) and what I’m smelling is drifting apple blossoms. The air is perfumed for miles with that beautiful smell. The cooler weather arrested the lilacs, for which I am grateful – they are just about to open but haven’t yet, which gives the apples a few days to reign supreme. It’s such a clean, perfectly natural scent. And the beautiful petals, drifting like snow, in the brisk wind…absolutely lovely! Laura: Enormous Star Magnolia with a scent of jasmine, first the petals open as a star, the fragrance lovely. Using floral tape I made beautiful sweetheart bouquets using purple muscari, lavender hyacinths, weeping cherry blossoms and white camellia. So charming. Hoping the muguet will bloom in time for its namesake holiday on May 1. Sherri M: The smell of Spring this week in Tennessee is lilacs and fresh cut grass (we’ve already had three mowings with Spring coming so early). I brought a bunch of lilacs in to enjoy and smell them each time I walk past the table. As far as smelling perfume on others, since I have five teenage girls, I smell a lot of Taylor Swift Wonderstruck and every Victoria’s Secret Pink/Hollister/Rue 21 etc. candy fruity thing ever made. Even on adult women, I smell a lot of fruity florals (most very chemical) along with J’Adore and Viva la Juicy and Flower Bomb in my everyday suburban life.